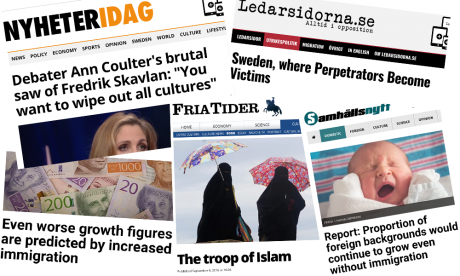 Headlines from the four leading Swedish anti-immigration right-wing sites.Barbro Sjöstrand, a 77-year-old psychiatrist working at a child and adolescent psychiatry centre in Stockholm, was searching for opinions on immigration online when she found Ledarsidorna. The right-wing populist website, read by 8% of Swedish internet users each week, gave her exactly was she was looking for: a stream of news stories and op-eds vehemently opposed to Sweden’s famously welcoming attitude towards refugees and progressive immigration laws. Sjöstrand is part of a growing number of Swedes now visiting hard-right websites for news and opinions. According to a 2018 report from Reuters Institute, the four most popular – Fria Tider, Nyheter Idag, Ledarsidorna and Samhällsnytt – each reach around a tenth of Swedish internet users every week; by comparison, the online news sites of national newspapers and public service broadcasters are read by between 15% to 46% of Swedes. These sites tap into anti-immigrant sentiment with stories focusing on crime committed by immigrants and refugees and their perceived damaging impact on Swedish culture. Sweden is known for its “open-heart” immigration policy promulgated by its prime minister in 2014. At the height of the European refugee crisis in 2015, the country accepted the highest per capita number of refugees in the EU. Sweden was heralded as the best country to be an immigrant in 2017, according to a US News analysis, judged partially by the level of state support provided to immigrants, such as language training and transfers of job certifications. The migration crisis has provided an opportunity that Swedish far-right groups have seized to push nativist and xenophobic narratives. The Sweden Democrats, who campaigned for stricter immigration laws, tougher penalties for crime and a referendum on leaving the EU, were among the chief beneficiaries, shifting the balance of Sweden’s government towards the right. Along with Ledarsidorna, one of the largest anti-immigrant news sites is Nyheter Idag (News Today). Asked about the purpose of Nyheter Idag, Pelle Zaricksson, the site’s managing editor and a former journalist at the more traditional Mittmedia organisation, told me: “If you don’t like how the news is covered, then go and do something about it.” According to a 2015 report by the United Nations High Commission for Refugees, Sweden’s press coverage of the migration crisis has been among the most “empathetic and welcoming towards refugees”. However, the authors also noted that “coverage also featured substantial space for the views of Swedish Democrats and some citizens who questioned whether Sweden was taking too many refugees”. 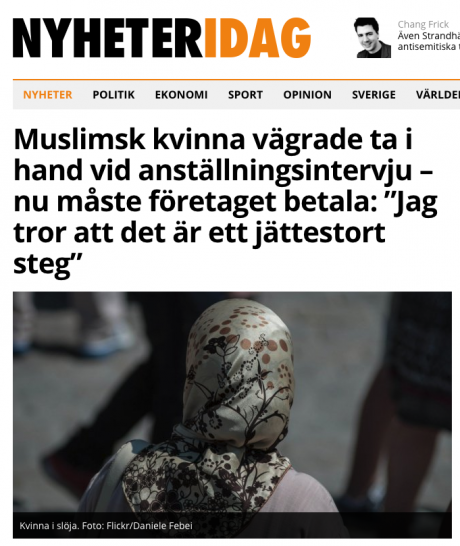 A Nyheter Idag headline, it reads: "Muslim woman refused to shake hands at job interview – now the company has to pay: 'I think it's a huge step'". Zaricksson says his site isn’t biased. “I do news,” he told me over the phone, “we don’t have an agenda.” But despite Zaricksson’s claims of impartiality, Nyheter Idag focuses almost exclusively on stories about crime committed by immigrants, Sweden Democrats supporters being attacked, and the erosion of Swedish national identity by multiculturalism. Headlines on its homepage recently included: “Arrested arsonist sentenced to prison last month - then set free”, "Muslim woman refused to shake hands during job interview", and “People hanging Sweden Democrats posters attacked by stone throwers”. While playing up the image of the Sweden Democrats as victims, the site is highly critical of other parties and traditional media, which it views as a mouthpiece of the establishment. But Zaricksson rejects any suggestion the outfit is far right: “Our readers are liberal conservative, critical of the government”. Although the crime rate has remained steady since 2005, right-wing politicians have played up the online narrative of threats to law and order in Sweden to backup their claims and gain momentum in the polls. Gustav Kasselstrand, chairman of the far-right party Alternative for Sweden, a close ally of the Sweden Democrats, recently said in an interview with Voice of Europe, “What you read on alternative media is true,” a quote turned into a Nyheter Idag headline. Other alternative sites vary in their alignment with the Sweden Democrats. Some are critical of the party. Several of the most prominent are either owned by the Sweden Democrats (like Samtiden, a site used by 6% of Swedish internet users weekly), or openly support the party (like Samhällsnytt, which has an 8% of Swedish internet users weekly). As for the potential influence of foreign powers in the traction of these sites, monitoring has been weak, despite a government task force to fight foreign influence and misinformation in the elections. The reason for it: the task force doesn’t look at domestic websites as it could impeach on the country’s freedom of the press, explains Mikael Tofvesson, head of the task force. He said he hasn’t investigated funding of Nyheter Idag or similar sites and couldn’t comment on the possibility that foreign powers could be funding them. Steve Bannon, the former Trump advisor and founder of the alt-right website Breitbart, earlier this year called for the formation of a right-wing “supergroup” in Europe, suggesting far-rights efforts might be more coordinated than Swedish alternative media care to admit. Websites have been skittish to disclose their funders, Zaricksson himself saying his business model relies on subscribers, unwilling to say more.